Generates the upwind gradient field of fast marching arrival times. This filter adds some extra functionality to its base class. While the solution T(x) of the Eikonal equation is being generated by the base class with the fast marching method, the filter generates the upwind gradient vectors of T(x), storing them in an image. Since the Eikonal equation generates the arrival times of a wave travelling at a given speed, the generated gradient vectors can be interpreted as the slowness (1/velocity) vectors of the front (the quantity inside the modulus operator in the Eikonal equation). Gradient vectors are computed using upwind finite differences, that is, information only propagates from points where the wavefront has already passed. This is consistent with how the fast marching method works. One more extra feature is the possibility to define a set of Target points where the propagation stops. This can be used to avoid computing the Eikonal solution for the whole domain. The front can be stopped either when one Target point is reached or all Target points are reached. The propagation can stop after a time TargetOffset has passed since the stop condition is met. This way the solution is computed a bit downstream the Target points, so that the level sets of T(x) corresponding to the Target are smooth. Luca Antiga Ph.D. Biomedical Technologies Laboratory, Bioengineering Deparment, Mario Negri Institute, Italy. Definition at line 60 of file itkFastMarchingUpwindGradientImageFilter.h. Definition at line 85 of file itkFastMarchingUpwindGradientImageFilter.h. 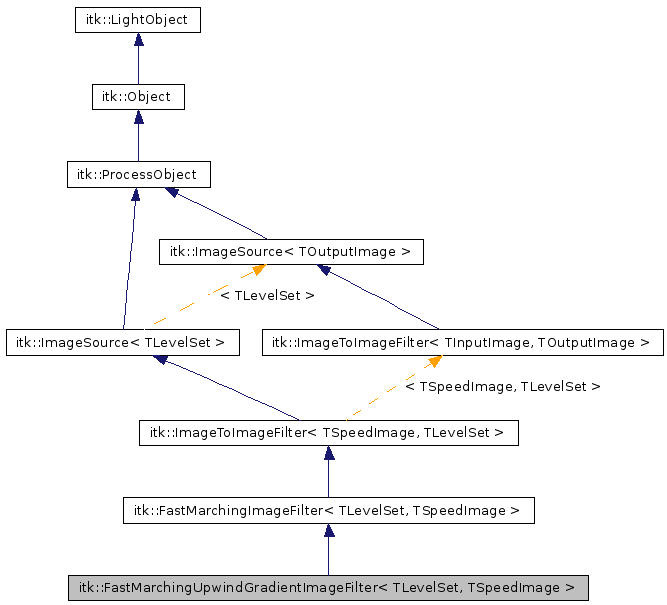 Reimplemented from itk::FastMarchingImageFilter< TLevelSet, TSpeedImage >. Definition at line 69 of file itkFastMarchingUpwindGradientImageFilter.h. Definition at line 127 of file itkFastMarchingUpwindGradientImageFilter.h. Definition at line 124 of file itkFastMarchingUpwindGradientImageFilter.h. Definition at line 120 of file itkFastMarchingUpwindGradientImageFilter.h. Definition at line 90 of file itkFastMarchingUpwindGradientImageFilter.h. Definition at line 83 of file itkFastMarchingUpwindGradientImageFilter.h. Definition at line 80 of file itkFastMarchingUpwindGradientImageFilter.h. Definition at line 92 of file itkFastMarchingUpwindGradientImageFilter.h. Definition at line 81 of file itkFastMarchingUpwindGradientImageFilter.h. Definition at line 75 of file itkFastMarchingUpwindGradientImageFilter.h. Definition at line 87 of file itkFastMarchingUpwindGradientImageFilter.h. Definition at line 88 of file itkFastMarchingUpwindGradientImageFilter.h. Definition at line 86 of file itkFastMarchingUpwindGradientImageFilter.h. Definition at line 91 of file itkFastMarchingUpwindGradientImageFilter.h. Definition at line 84 of file itkFastMarchingUpwindGradientImageFilter.h. Definition at line 68 of file itkFastMarchingUpwindGradientImageFilter.h. Definition at line 94 of file itkFastMarchingUpwindGradientImageFilter.h. Definition at line 66 of file itkFastMarchingUpwindGradientImageFilter.h. Definition at line 82 of file itkFastMarchingUpwindGradientImageFilter.h. Definition at line 79 of file itkFastMarchingUpwindGradientImageFilter.h. Definition at line 67 of file itkFastMarchingUpwindGradientImageFilter.h. Definition at line 174 of file itkFastMarchingUpwindGradientImageFilter.h. Definition at line 192 of file itkFastMarchingUpwindGradientImageFilter.h. Definition at line 130 of file itkFastMarchingUpwindGradientImageFilter.h. Get the number of targets. Get the container of Reached Target Points. Definition at line 115 of file itkFastMarchingUpwindGradientImageFilter.h. Get the container of Target Points. Definition at line 111 of file itkFastMarchingUpwindGradientImageFilter.h. Get the arrival time corresponding to the last reached target. The dimension of the level set. Set the GenerateGradientImage flag. Instrument the algorithm to generate the gradient of the Eikonal equation solution while fast marching. Set how long (in terms of arrival times) after targets are reached the front must stop. This is useful to ensure that the level set of target arrival time is smooth. Set the container of Target Points. If a target point is reached, the propagation stops. Trial points are represented as a VectorContainer of LevelSetNodes. Definition at line 103 of file itkFastMarchingUpwindGradientImageFilter.h. Choose whether the front must stop when the first target has been reached or all targets have been reached. Definition at line 164 of file itkFastMarchingUpwindGradientImageFilter.h. Definition at line 155 of file itkFastMarchingUpwindGradientImageFilter.h. Definition at line 157 of file itkFastMarchingUpwindGradientImageFilter.h. Definition at line 159 of file itkFastMarchingUpwindGradientImageFilter.h.